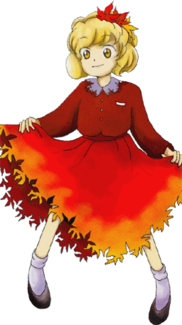 Because she and her sister were ranked the lowest of the Windows characters in a year's annual Touhou Popularity Poll, there is a running joke in Japan that they are "original characters" with negligible presence in the games. There is a doujin anthology project dedicated to the Aki Sisters, perhaps to compensate for this. On her character portrait, the leaves on her head roughly resembles a crab if they are seen as a single piece rather than two. This occasionally leads to her being associated with one, the leaves on her head being replaced by one, or herself replaced by one in fan works. Aoneko (Nicovideo) (Pixiv), noted to be one of the biggest fans of the Aki sisters, started an Aki sisters-only video website called AkiTube.